When Western eaters think of Japanese food, most think of sushi and ramen, but the Japanese have transformed India’s comforting curry into a national dish. Introduced by the British navy around 1868, the Japanese kept the standard British-style brown gravy — warm and aromatic, spiced but not spicy, thickened with a roux — and created something wholly their own. 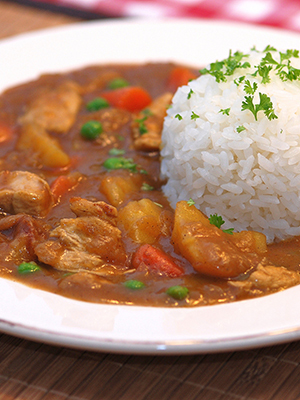 In Japan, curry takes the form of both high art and all-night fast food. Entire restaurant chains have devoted themselves to it, most notably CoCo Ichibanya, whose 34 flavors include eggplant, seafood, spinach, and cheese. (I order it with side of garlic and ketchup, which they call “tomato.”) Many places let diners choose their curry base — spicy or regular? — choose their toppings, and choose their size. 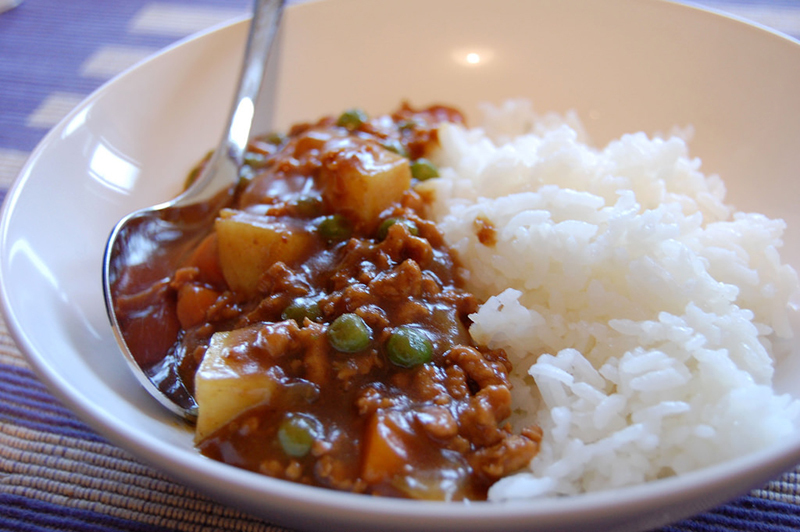 I love Japanese curry. I eat it whenever I can. Unfortunately, that’s not frequently enough, since few Japanese restaurants serve it where I live in Oregon. On this trip, a certain curry shop stole my heart. I don’t know its name; its signs were in Japanese. 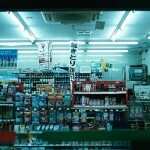 But it was located within the maze of Shinjuku Station’s halls and corridors. I discovered it by accident. After that, I worked hard to find it again. After navigating the station’s crowded passageways day after day, I welcomed any quiet place to recharge. 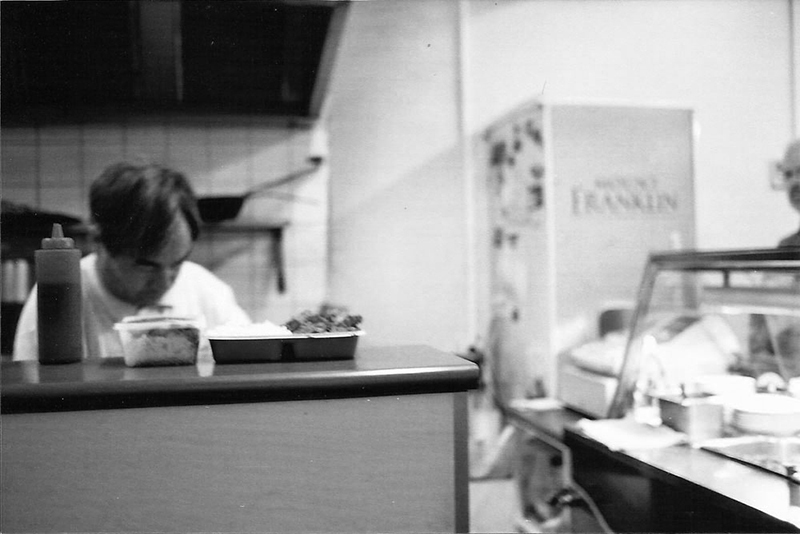 This curry restaurant consisted of a single circular counter lined with stools. Two open doors looked out onto the busy passages. Two young women in SARS masks set plates in front of diners. The clink of coins filled the air, as people paid for their meals at self-serve shokkenki ticketing machines outside the front doors. I lowered myself onto its cushioned vinyl stools and enjoyed the chance to stop moving in this city of constant motion. Right outside, commuters streamed by, thousands upon thousands, their perpetual movement filling the corners of my eyes with a colored strobe even while I looked down at my plate. Customers rarely looked up. They came and went quickly, devouring their food as if it was work. That’s how people eat in Japanese stations. They’re in a rush, en route to a meeting, or trying to catch a train. Diners come in, eat, keep their head down, and leave. Initially, I thought it was a shame to rush like that because the food was so good it seemed wrong not to savor it — especially as fatigued as I was from the stressful, disorienting labor of navigating the world’s most populous city. Eventually, I realized that there are different meals for different situations. Some meals are meant to fuel you. 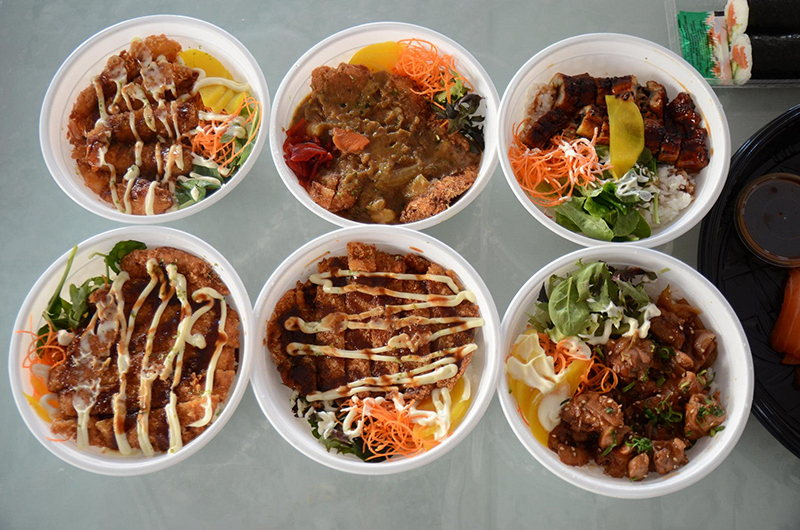 Some meals are meant to savor, like the ramen at Tokyo’s Ramen 69 ‘n’ Roll, where the chef prohibits speaking because he believes his chicken ramen is so good that you should focus on it. And like Jiro Ono’s world-renowned sushi, which you eat with your hands, without soy sauce or additional wasabi, because that’s how he makes it, and that’s how it tastes best. Some of Tokyo’s best restaurants are located in its train and subway stations. This wasn’t one of them. It was a commuter filling station. 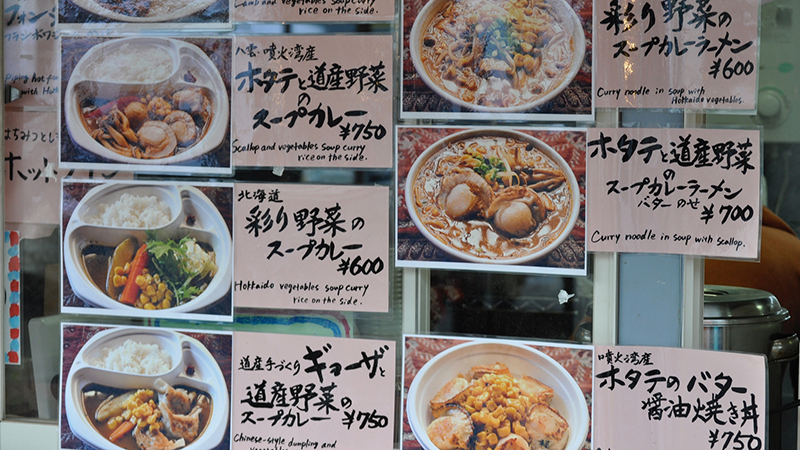 Tokyo has thousands of curry restaurants like it. From the counter to the food, it was, as they say, standard fare. 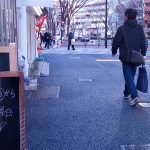 But Japan’s average station food often tastes way better than what Americans consider average, and I fell for this place because at the time that I found it, it offered what I needed most: comfort food where the atmosphere was just as comforting. “Until the Meiji Period,” essayist Donald Ritchie wrote in Viewed Sideways, “the latter half of the nineteenth century, Japan had no arches, cornerstones, fireplaces, armchairs, or farthingales.” And no curry. The British navy brought the dish to Japan around 1868. According to the BBC, “The first curry recipe in English was published by Hannah Glasse in 1747,” but it was an Englishman named Warren Hastings, of the East Indian Company, ate the dish in Bengal, India in the 1770s while the subcontinent was under British rule. In 1772, Hastings served it to the royal family. They loved it, and it became a regular meal at royal functions, where it caught on with the aristocracy. During the Edo Period in the early 1600s, Japan’s ruling Tokugawa saw the West’s true designs in their aggressive tactics and advanced weaponry, so Japan largely closed its shores to trade and visitation and tried to secure its sovereignty. For 200 years, Japan remained isolationist. On July 8, 1853, U.S. Naval officer Commodore Perry took four warships into Tokyo Harbor, ignoring official requests to go to the open port of Nagasaki, and the blanks he fired from his 73 cannons confirmed the Tokugawa’s impression of the aggressive West and ended the closed country, or sakoku, period. The Japanese saw that their hermetical strategy couldn’t work long-term in this imperialistic era, so they changed tactics: They adopted Western technology, strategies, and weapons to defend themselves, which they had done before the sakoku with clocks, glasses, and weapons, and expanded militarily. This was the logic of the Meiji Period. Based on ideas by writer and thinker Yukichi Fukuzawa, Japan adopted “Western implements” to protect their independence and culture, from steamships to telegraphs, and to “modernize,” meaning, to learn to function in the new world dominated by a few white, Western powers like the US, France, and England. Japan needed to protect its interests and identity. It did so partly by taking what it needed from the West and adapting it to their way of life and thinking. As Michael Zielenziger said in his book Shutting Out the Sun: How Japan Created Its Own Lost Generation, “Japan appropriated the tools of the West but renounced the culture that had created them.” The same went for food. When Meiji Japan opened itself to outside visitors and trade, it imported new ideas, products and foods like fried croquettes and spaghetti and heralded the more Westernized era of American jazz, skyscrapers, and coffee shops — and an intense love affair with curry. Japan is known for many foods: sushi, tempura, ramen, and green tea. All of those originated somewhere else, and the Japanese perfected and personalized them. Tempura came from Portugal. 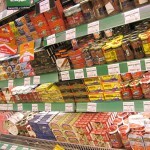 Ramen noodles came from China, along with green tea. Even the idea of placing raw fish on acidic rice originated in Thailand, though what’s called sushi completely originated in Japan, likely around Lake Biwa near Kyoto. It’s not that every culture’s signature dish must arise sui generis. The Japanese are interested in what else the world is doing, and they find what they like and make it their own, from music to denim, coffee to single-malt Scotch whisky. Cultures share. Japan perfects. As a Tokyo noodle maker said of ramen noodles in Mind of a Chef: “The original form of it may have come from China, but we’ve made it our own culture, and it is continuously developing. The possibilities are endless.” This sense of possibility, the spirit of adventure, innovation and experimentation, mixed with Japan’s dedication to mastery, are some of the qualities that make Japanese food and technology some of the best in history. The same can be said of their curry. Curry, like ramen and nikujaga beef stew, reflects the Japanese’s ability to find an item from the West or other parts of Asia and modify it to their tastes to the point that it becomes such an integral part of their culture that it’s distinct from the original. 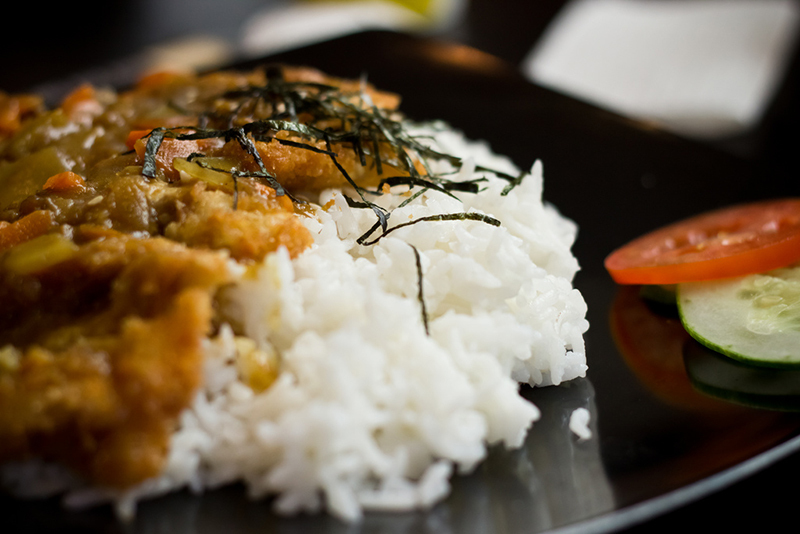 This last part relates to the category of Japanese foods called yōshoku: Japanese takes on Western dishes, like omurice (an omelet filled with rice), hambaagu (a bun-less hamburger crossed with a Salisbury steak) and kurīmu shichū (cream stew). Yōshoku developed during the Meiji Period. Limited Western ingredients and limited knowledge of the recipes meant that the Japanese versions were inventive and unique, rather than poor imitations. Many yōshoku, especially tonkatsu and curry, seem so Japanese that people don’t always know they originated somewhere else. As Freud could have said, curry is not always curry. Here, it’s constructive multiculturalism born of imperialism.